Placed at an approximate distance of 20 km from Kamla Nehru Zoological Garden, Pleasure Club has a swimming pool on the premises. This property in Ahmedabad is accessible from the Ambli Road Railway Station, which is 8 km away.This accommodation in Ahmedabad has a total of 12 well-appointed guestrooms, equipped with essential requisites. 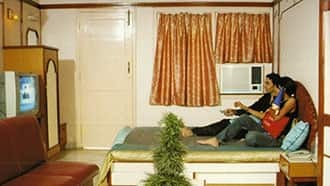 Rooms include conveniences like television, wardrobe, tea/coffee maker, and attached bathroom with hot/cold running water supply.Along with a host of conveniences, Pleasure Club has various facilities that include a restaurant, business center, banquet hall and luggage storage space. Additionally, conveniences such as laundry, wake-up calls, room service and front desk assistance are also available.Travel hubs nearby include Sardar Vallabhbhai Patel International Airport (34 km) and Ahmedabad Railway Junction (19 km). Visitors can explore tourist spots like Sabarmati Ashram (20 km), Jhulta Minara (19 km) and Teen Darwaja (16 km). Full refund if you cancel this booking. Nice place for non veg lovers. You can also play paintball there. Food is amazing and finger licking. Service is good and staff is friendly and full of affection. Best to visit during night. Visit to refresh mood. Recently we had a wonderful day at pleasure club with friends and family It's very nice place for a day picnic near Ahmedabad. They have very good facility catering all age requirement. A swimming pool, kids play area, kidz adventure zone, garden for morning and evening seating, top covered area near kids play area for afternoon seating , cricket ground, paint ball game, A/c hall for afternoon rest. We thank to Mr. Bhavin shah manager at club for providing very good service as committed. Food quality was also good. So overall perfect place to spend a entire day with friends. And I will recommend this place for family outing. ooks can be deceptive and A best example of it is this restaurant. Roaming around Bopal area, Zomato came up with recommendation of AQVA. Pictures were really good and that's what forced us to visit the place for dinner. On arrival we were really shocked to see the actual ambience. The first impression gave a really shady feeling and the said feeling just kept on increasing by every minute. While they call it a pool side restaurant, it seems more of a cheap garden restaurants you find on state Highways. Someone needs to tell the management that merely putting a huge picture of a beach dies not give a beach side feeling. Also the fact that they have a party lawn just next to the pool which had some event and created a really nuisance for the people having dinner. While they have a large screen, seems it is used to play only the cheap item numbers of bollywood. Food - A really Shocker. Ordered 3 soups. All were OK but none of it was fresh. Masala papad was literally dipped in oil. Pizza had only cheese and tomato ketchup. Dal and rice were also not upto the mark. None of the food items were convincing. Also the fact that rates are really exorbitant. Who would charge 200 bucks for a 6" pizza which has only ketchup and cheese? This place is a perfect location for the small team get together. We had an opportunity there to spend 4 hours which passed quite decently. It has got a huge lawn, pool side restaurant, indoor games and a big ground for playing outdoor games. It also has beautiful lawn and stage which can be used to celebrate functions and have open lunch/dinner. Overall perfect..